Like a kraken rising from the depths (or a cuttlefish emerging from the sand), Cephalopod Week is back! Every year, during the third week in June, Science Friday honors the mighty cephalopod—the clever, mysterious class of creatures that, as professor of psychology Frank Grasso once said, are the closest things to alien intelligence on Earth. 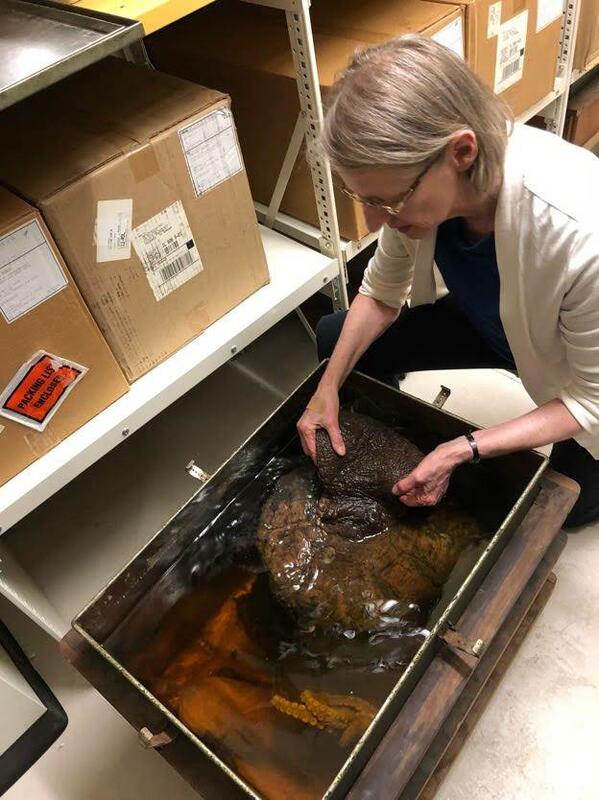 To kick things off this year, we took a trip deep into the basement of Chicago’s Field Museum with curator Janet Voight, who showed off vampire squids, cuttlefish, and the piece de resistance—a huge crate pulled from the bottom shelf containing a giant Pacific octopus ‘rescued’ from a fish market in 1906. In this segment, Janet joins Ira and SciFri’s chief cephalopod cheerleader Brandon Echter to talk about the unusual and brainy behaviors of these creatures—including a squid that uses bioluminescent bacteria to camouflage itself—and whether cephalopods could someday become a model organism as ubiquitous in labs as mice and fruit flies. Can’t get enough of the cephalo-mania? Learn about a tiny squid that works with bacteria to camouflage itself, and one laboratory that hopes that cephalopods will one day be as ubiquitous in labs as mice or fruit flies. Check our more Cephalopod Week here! Janet Voight with the Field Museum’s giant Pacific octopus specimen, which dates back to 1906. Photo by Brandon Echter. Janet Voight is associate curator of invertebrate zoology at the Field Museum in Chicago, Illinois. IRA FLATOW: This is Science Friday. I am Ira Flatow, and since the sci-fi team is in Chicago this week, we paid a visit to the famous Field Museum. And boy, did we get a great behind the scenes tour. But to get there, we had to descend flight after flight of stairs, deep into the basement vaults where specimens are kept. And there, in a library-like room smelling of preservation and alcohol, our guide wheeled open a set of shells and welcomed us to the cephalopod collection because yes, it is that time of the year. Cephalopod week, and what better way to kick it off than geeking out in the basement of the Field Museum. I can’t think of anything better. Admiring the vampire squids, the cuttlefish, and a magnificent giant Pacific octopus. And our guide who showed us all this stuff was Dr. Janet Voight, associate curator of invertebrate zoology at the Field Museum, and she’s here with us. Welcome. JANET VOIGHT: Oh, thank you for coming. It was so much fun yesterday. IRA FLATOW: Wasn’t that fun? IRA FLATOW: And also with us here, who is also on the tour, is Science Friday’s chief cephalopod cheerleader and digital managing editor, Brandon Echter. Welcome back, Brandon. BRANDON ECHTER: Thank you, Ira. Happy cephalopod week. IRA FLATOW: It’s your favorite time of the year, isn’t it? BRANDON ECHTER: It is my favorite time of the year. It is the best time of the year. IRA FLATOW: Kick it off for us. BRANDON ECHTER: So, as you know, every June– the 3rd week of June– we dedicate eight days, of course, to celebrate cephalopods. And that’s that class of species that includes octopuses, squid, cuttlefish, nautiluses, and all sorts of ancient creatures as well. So, and we usually do that on social media with finding really cool stories to share with you, and we celebrate it. We want to make sure that we celebrate these amazing and fascinating creatures. IRA FLATOW: So, what do you have in store for us this week? BRANDON ECHTER: Oh, we have so much ready coming up for you this week. So, right now we have a bunch of new stories that are going to be coming out throughout the week. We have two new videos up about cephalopods, about the bobtail squid, about a bunch of species up in Woods Hole. We have cephalopod movie nights in cities around the country, where we’re going to be showing some cephalopod movies. Cities like Denver, New York City, Los Angeles, Seattle, San Francisco, where you could see, in addition to those movies, a psychedelic, underwater music show, a marionette show, a talk that is called octopuses– they’re not aliens, but they’re still awesome. Talks with experts, things like that. We’re going to be showing stuff on social media all week long, and we want to, of course, celebrate cephalopods with you. So, we want to know– show us your favorite cephalopod. Let’s celebrate these creatures together. IRA FLATOW: Right. And we’ve already posted– so there’s some of tour. I know I took videos of the tour that you gave us yesterday. JANET VOIGHT: If I had known you were going to post the video on Twitter, I would have combed my hair. JANET VOIGHT: And I got to say, yeah, eight days for the cephalopod week is great. But couldn’t you make it 10 for the squids? IRA FLATOW: Are they your favorite, cephalopod? JANET VOIGHT: Oh, the cephalopods, in total, are just fascinating creatures. I actually am more partial to octopuses, where I’ve spent most of my work. Squids, though, there’s something about them. They’re so diverse. There’s like 26, 28 families, and you look at it and you go, that’s over there, and this is over there. And somehow they all came together, and they started from one branch– or was it two? You don’t have to be alien to be awesome, and they prove it. IRA FLATOW: And you you showed us, down in the basement, you opened up this big– I don’t know what it was made out of– but it was a big tin of– inside was a 112-year-old octopus. IRA FLATOW: It’s been sitting there in the museum for 112 years. JANET VOIGHT: The way I think of it, it’s a 112-year-old specimen. JANET VOIGHT: We don’t know how old it was when it was preserved. The note– when I came– that was with it, send purchase to the sea at a fish market in Seattle, 1906. And I think at one point it must have been an exhibit because where it should have eyeballs, it has really pretty blue marbles. But I also showed you guys our paper mache, life size giant Pacific octopus. The arm span is 18 feet. It hangs over our what is an animal exhibit, and it just shows you how much effort we at the Field Museum have made to show the people at Chicago cool animals from the seas. IRA FLATOW: Speaking of cool animals, you were telling us and you showed us a glass model of the paper Nautilus, which has a very unique talent, doesn’t it? It had something about– its arms break off? What happens? JANET VOIGHT: When they’re males. IRA FLATOW: When they’re male. Tell us about that. JANET VOIGHT: Yeah, well, it’s actually– paper Nautilus is somewhat of a problematic common name, because they’re not really a Nautilus, although the shell the female secretes is curved like that. This is one of a group of four families that have extreme sexual size dimorphism. Males who may be, at most, as long as an index finger. And females can get so large you can pick them up with both hands. The males, however, regardless of how small, have one arm that’s really elaborate. Really a long, pointy thing, and that’s the hectacotylus. It was first described from inside the female. It was thought to be a parasitic worm. So, it was like, what’s that doing in there? She must have worms. But in fact, it was found later that that arm is the male copulatory organ, and it breaks off– or, in fact, has been hypothesized– to break from the male and actively swim into the females oviduct carrying sperm. IRA FLATOW: You can’t top that story. It’s too hard. JANET VOIGHT: Oh, let’s try. IRA FLATOW: 844-724-8255 is our number if you talk to Janet Voight, who is a curator of zoology in the famous Chicago Field Museum, and Brandon Echter is our digital managing editor here. Stories like that, you got to love cephalopods, right? BRANDON ECHTER: Oh, man, Ira. People ask me sometimes, like, what’s my favorite cephalopod, and it’s a little bit like asking what’s my favorite child, you know? You definitely have favorites, but you don’t want to say. But one of the ones, the samples that we actually saw that Jenna showed us yesterday was one of my favorites, the vampire squid, which is actually neither a vampire nor a squid. JANET VOIGHT: It’s kind of a missing link. It has characters who are totally unique to the octopods. It’s suckers who are all muscles. Squids have suckers that are muscular, but they also have teeth, and chitinous rings around them. It has an internal difference in digestive organs that’s really unique, and it has eight arms like octopuses do. But it has two extra long grabby things, we always thought. But they’re not like the two extra long grabby things that squids have. They’re in the wrong position. They’re opposite. So, it’s like, how can this be? JANET VOIGHT: And Grace Pickford, in like 1949, did a monograph on these things using only [INAUDIBLE] specimens. And vampyroteuthis live in the mid-water. They’re neutrally buoyant. They’re soft bodied. They’re prone to damage in the trawl net, and she pieced together this beautiful ontogeny of how the fins– there’s juvenile fans that are absorbed, and the miniature fins come out, and all these differences occur. She did it with [INAUDIBLE] specimens without ever seeing the beautiful Monterrey Bay Aquarium Research Institute videos, which are just stunning. IRA FLATOW: How did you get involved? You mentioned yesterday that you have, what, six or eight species named after you? JANET VOIGHT: Well, not of cephalopods. IRA FLATOW: Not cephalopods, but marine creatures. JANET VOIGHT: Yeah. Well, know when I was in college, I got involved with terrestrial vertebrate research. They were an internship, and I loved, loved, loved research. Just being the first to discover something and write it up and get it published, and then give it away for free. It was so cool. And I had to work for a few years after college. And I did the routine job. I was a lab tech, and I just hated it. So, I decided I’d go back to grad school at the ripe old age of 27. Nobody did that back then. JANET VOIGHT: Absolutely. I was torn. What did happen? Go through a bad divorce? So I figured I’d go and I’d keep doing terrestrial vertebrates, like I had, only it wasn’t magic. So, the guy who had taken me on as temporary advisor needed one more person to sign up for his Marine Corps to make quota and have it go. So, I signed up, started working on octopus, and life’s been really good ever since. IRA FLATOW: Wow. What is the most misunderstood thing that people have about octopus? JANET VOIGHT: There’s a lot of them. One of which is that octopus is like the word dog. You could talk about a chihuahua or a Saint Bernard, and it’s still a dog. When we talk octopus, we’re talking about up to 300 named species that are valid, as different as any species anywhere. The other thing is that they are like us in a lot of ways, even though their DNA is different, they’re mollusks. They’re not chordates. But their whole life cycle is entirely different. When they hatch out of the egg, some are very small. They go into the plankton for a month or two, and then settle. Look like miniature octopuses. Others hatch out like miniature octopuses, weighing 4/100, or 7/100 of a gram. IRA FLATOW: Boy, that’s tiny. JANET VOIGHT: Over the course of their lives, the ones that are 40 milligrams when they hatch grow to 40 grams in 6 and 1/2 months. IRA FLATOW: Now, you said that– you were telling us that they gain 6% of their body weight a day. JANET VOIGHT: A day. They have a 40% growth efficiency. JANET VOIGHT: The species that was sequenced, its DNA as a genome, I mean. You can tell I’m a traditional type. Genome Janet. It hatches out at 7/10 of a gram. It grows to an average 620 grams over the course of 6 and 1/2 months. That’s a 9,000 fold increase. JANET VOIGHT: Think about that. Think about it if you’re an animal, and you grow that fast, how do you interact with your environment where one day you’re this big, the next week, you’re twice this big. Maybe that’s why they’re so smart. IRA FLATOW: Maybe that’s why. Brandon, you know we love to talk about the microbiome on this show, and one of our videos for cephalopod week this year is about the squid microbial. IRA FLATOW: What a life. BRANDON ECHTER: I know, right? I wish I had it. But like all chefs, they’re very easy to eat. She basically calls them a floating protein bar. So, a lot of cephalopods have very great, interesting adaptations for trying to escape predators. And in this case, they actually have an unusual bff, which is this bioluminescent bacteria. So, the Hawaiian bobtail squid likes go hunting at night, and when your predators are coming up from below, you can see a squid-shaped shadow against the moon. So, it uses its bioluminescent bacteria to match the moon glow of the water around it. So, basically, it uses this beneficial bacteria to survive in the world. IRA FLATOW: Trick, tricky, tricky. I’m Ira Flatow. This is Science Friday from WNYC Studios. Talking shop here, actually, about cephalopods, and on cephalopod week with Janet Voight from the Chicago Field Museum, and Brandon Echter, our digital managing editor. And there are so many stories you were telling. Where do we go– how cunning the cephalopods are. How tricky they can be when they’re hunting. And you tell us one story that was really interesting about an octopus that our venomous, that can play tricks on crabs. Tell our audience that [INAUDIBLE]. JANET VOIGHT: Well, there was this study by this guy named Grizzly. And he was studying, how come with these crabs, which are octopuses’ favorite food, there weren’t any puncture wounds. And we know they envenomated them. The venom paralyzes the crab and makes it so safe for the octopus to eat. They’re very delicate, you know? So, he did this careful study and he realized the octopus actually punctured the crab preferentially in the eyeball. So, the last thing the crab saw was that the octopus beak coming at him. After that puncture was done, it’s a direct shot into the crab’s brain, and paralysis, except for its heart. Their heart keeps beating to spread the venom around. That venom not only paralyzes the crab, but it dissolves the connections between the crab meat and the exoskeleton. IRA FLATOW: It sounds like a horror movie. JANET VOIGHT: Pop it open. IRA FLATOW: Pops it right open. JANET VOIGHT: Well, that’s how you grow so fast. You don’t do a lot of work. You’re a really efficient killer. And then, when your belly is full, you sit back. Couch potato. BRANDON ECHTER: Relax on the sand. IRA FLATOW: Are they as smart as they, you know– are octopuses very smart? Where would you put them in, in smartness? JANET VOIGHT: Conversationally, they’re not great. I’ve heard them compared to 3-year-olds. I’ve heard them compared to house cats, to which I say, my cat’s smarter than that. But they recognize people when you have them in captivity, and they get bored. If you’ve had fish tanks, you know the fish really don’t care whether you’re there or not. The octopus want to play with you. They want to follow you around. They recognize by maybe height, maybe hair color, who’s got the chow. And if they’re really hungry, they’ll suspend themselves with all their suckers up to the water’s surface, because that’s where the chow comes down. IRA FLATOW: Wow. There’s so many stories. 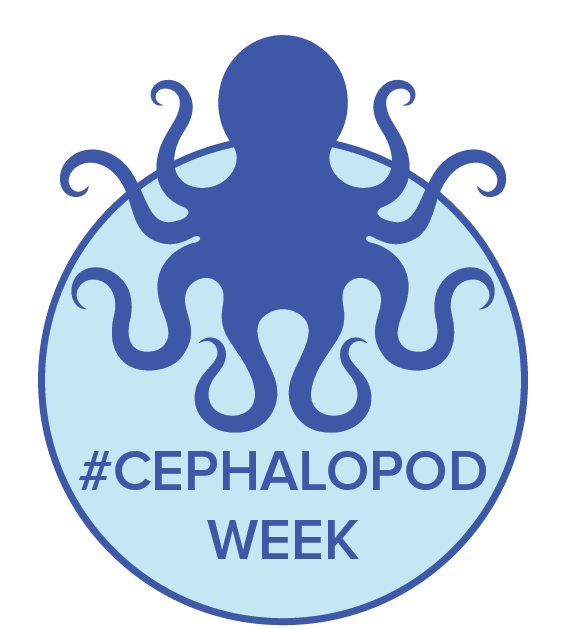 Before we conclude– running out of time, Brandon– tell our listeners how they can all get involved in cephalopod week. JANET VOIGHT: Which is really cool. BRANDON ECHTER: –which is a really cool video. And then, also, about cephalopod Inc, which is about the search for America’s Next Top Model organism, possibly cephalopods, including the flamboyant cuttlefish, which is one of my favorites. You can always join us on our hashtag. We’re using the hashtag #cephalopod week. We have a Facebook group, so just search for Science Friday cephalopod week on Facebook, where you can send submissions of all your cool stuff. And actually, we’re trying something new this year. We’re doing a cephalopod of the day text line. So, if you text the word cephalopod to 917-242-4070, we’ll send you a cool cephalopod, a fact about a cephalopod, and a new cephalopod species every day during cephalopod week. IRA FLATOW: What’s that number again? BRANDON ECHTER: That number is 917-242-4070. And we’re going to be sharing stuff about the vampire squid and some of the other species we talked about today, and of course come to our movie nights. JANET VOIGHT: Now, Brandon, is that a new, undescribed cephalopod species? BRANDON ECHTER: The one that can text? JANET VOIGHT: Or is it a different cephalopod species? BRANDON ECHTER: It is a different cephalopod species. JANET VOIGHT: OK. Sorry. Systematics and text. It’s like, new species. BRANDON ECHTER: Shame on me. Shame on me. IRA FLATOW: I want to thank both of you for taking time to be with us. Janet Voight, Associate Curator of Invertebrate Zoology at the Field Museum, and Brandon, who is our cephalopod week coordinator and digital managing editor. Thank you both for that tour yesterday, and for your efforts on cephalopod week.